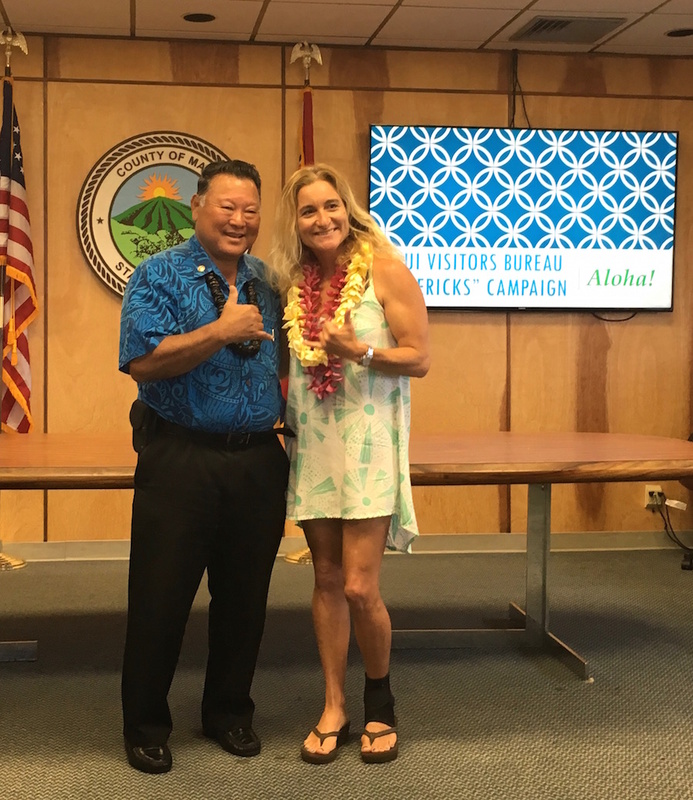 Dustin Tester, Maui Surfer Girls’ founder and director, was introduced this morning, along with 15 other Maui residents, as a Maui Maverick… Below is the press release about the new program. MAUI, HAWAII – What makes Maui so special isn’t just the island’s incredible scenery and sunsets. It’s also the people who live on Maui. 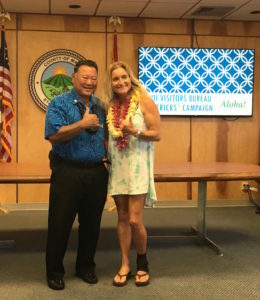 The Maui Visitors and Convention Bureau (MVCB) is showcasing 16 of these individuals with the launch of “Maui Mavericks,” a new public relations campaign aimed at promoting Maui Nui in national outlets and key markets in North America. 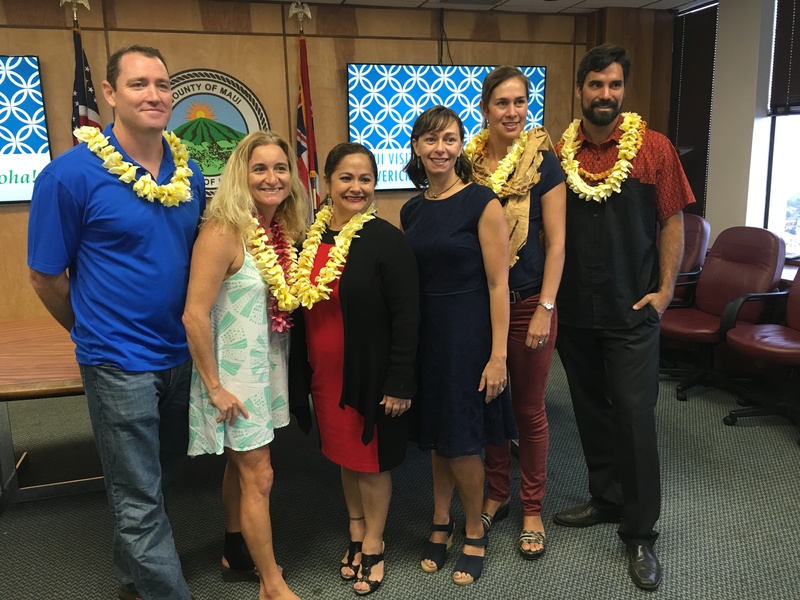 Through the campaign, MVCB hopes to increase editorial exposure and interest in travel to Maui, attracting a steady flow of visitors to help ensure a vibrant island economy. The new campaign shares the stories of Maui’s next generation of leaders. The Maui Mavericks are an ethnically diverse and multi-talented group of individuals moving Maui forward while preserving Hawaii’s culture and heritage. 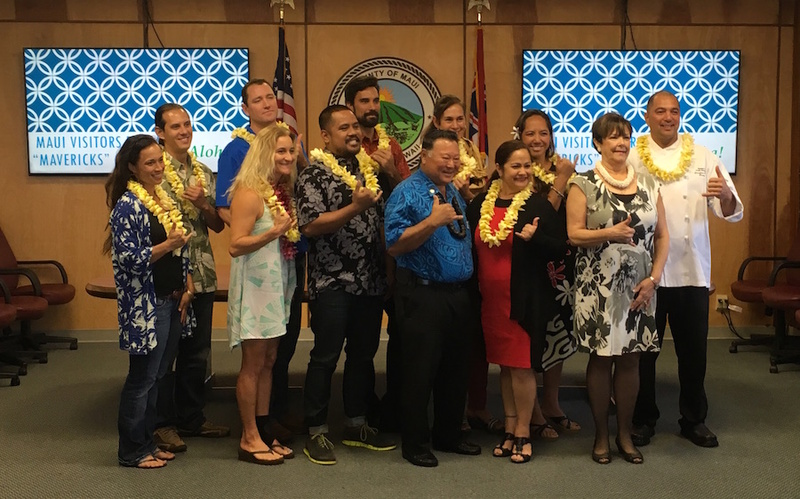 The inaugural Maui Mavericks class of 2016-17 includes a kapa (Hawaiian bark cloth) maker, a craft brew master, a taro farmer, a fashion designer, and 12 other talented, knowledgeable Mauians. Over the next two years, the Maui Mavericks will work with MVCB on-island and in key national markets, including Los Angeles, San Francisco, Seattle, Vancouver, Dallas, Chicago, Denver, and New York. They will host events, demonstrations and discussions, and share their inspiring stories through media interviews, social media, and interactions with the general public. The Maui Mavericks all embody several essential qualities: they are at the top of their game and part of the new wave of leaders in their respective fields; are fascinating individuals, with unique interests beyond their professional passions; are well-respected in the community and 100 percent committed to serving the islands. They malama (care for) the aina (land) and honor their kupuna (elders), while bringing exciting new perspectives and ideas shaping a bright future for Maui Nui. They are accessible to visitors and residents of Maui. Garrett Marrero (Agri-Tourism) – Founder and CEO of Maui Brewing Co.
Darren Strand (Agriculture) – President and CEO of Maui Gold Pineapple Co.
Maui Mavericks Class of 2016-17. Shay Smith, Dustin Tester, Napua Greig-Nakasone, Liz Smith, Denby Freeland-Cole and Kainoa Horjaco, all attended or teach at Seabury Hall!